We'll be visiting the epic Rose Theatre as well as Ballet Pixelle and Caledon's own Gaiety Theatre. Will post more times as I get 'em! Want to volunteer to take on a tour? Post it here and we'll get a group together! Jerry Buchko April 16, 2012, 10:10 a.m.
One of the many things my experience in our MOOC has inspired me to do is to further explore & study the growth of OpenSim grids and hypergridding <http://opensimulator.org/wiki/Hypergrid>. The OpenSimulator.org web site seems like it will be a useful resource for this. It appears to have a great deal of useful information on the topic and I think this grid list <http://opensimulator.org/wiki/Grid_List> will be particularly useful to study, both to identify the active open grids out there as well as their relative sizes and level of participant activity. Jerry Buchko April 16, 2012, 1:52 p.m. In Reply To: Jerry Buchko April 16, 2012, 10:10 a.m.
Aevalle Galicia/Stasia Weston April 16, 2012, 2:10 p.m. In Reply To: Jerry Buchko April 16, 2012, 1:52 p.m.
Jerry Buchko April 16, 2012, 2:46 p.m. In Reply To: Aevalle Galicia/Stasia Weston April 16, 2012, 2:10 p.m.
Aevalle Galicia/Stasia Weston March 24, 2012, 8:18 p.m.
Saturday night! Last tour for the week! Later, we'll head to the T2 PTSD Experience and see their tiered simulation as well as visit the area where the Federal Consortium of Virtual Worlds will be streamed into SL, coming up in May. We'll meet up at the Bay Boat Welcome Center at Jaguarland (http://slurl.com/secondlife/Jaguarland%20USA%20Education/63/20/27) and head out from there at 6pm slt. DelightfulDoowangle March 26, 2012, 8:12 p.m. In Reply To: Aevalle Galicia/Stasia Weston March 24, 2012, 8:18 p.m.
Stylianos Mystakidis March 23, 2012, 4:35 p.m.
Are you ready for a travel back in time to the magical era of the Maya? Join us on Saturday March 24th 2012, 9am PDT/SLT - 4pm GMT on UW Maya Island. Discover Maya Medicine, Astonomy, Agriculture, Language, Mythology and Sports! We'll finish with a instructional design tortilla party! Send an instant message (IM) to Stylianos Ling if you need a TP! kimmer March 25, 2012, 12:14 a.m. In Reply To: Stylianos Mystakidis March 23, 2012, 4:35 p.m. I enjoyed the UW Maya Island tour today. There is so much to explore and learn! I am intrigued by the teachers who were just leaving as our group arrived. When you mentioned they were just finishing, and they were from Estonia, I was again reminded just how endless the opportunities are in this virtual space. I would love to see how various content contributors to these builds could be guest speakers for high school classes. The rich research and potential to interact with 3D environments on a whiteboard in a classroom as an avatar with a speaker from someone across the globe or just across the US would be a tremendous asset. World Literature, World History, Biology, IB (International Baccalaureate) Theory of Knowledge... and the list goes on. Aevalle Galicia/Stasia Weston March 25, 2012, 1:27 a.m. In Reply To: kimmer March 25, 2012, 12:14 a.m. I would think that it would be very possible to have folks from a grid be guest speakers in a class, especially if you have a good internet connection and an overhead projector in the classroom. (You could log in as your avatar and the convo would be streamed onto the overhead) Otherwise, maybe a computer lab and a chat bridge (I think there are chat bridges in the Sloodle starter pack available inworld and in the marketplace?) might work. I've been involved in a "listening party" for a rather well known musical group and those who weren't able to be in SL were able to participate in a simple chat room embedded into a wiki and functioning through an SL chat bridge. Aevalle Galicia/Stasia Weston March 23, 2012, 3:15 p.m.
Don't forget today's "play date" to go exploring the skies and the waters of the Caledon Firth! We'll meet up at the Bay Boat Welcome Center at Jaguarland (http://slurl.com/secondlife/Jaguarland%20USA%20Education/63/20/27) and head out from there at 4pm slt. 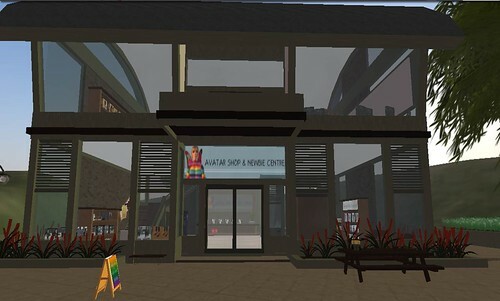 You'll have two chances to tour something in Second Life today (more if anyone else wants to volunteer!). The Maya folks have offered to take anyone who missed the tour during the conference through their sim on a guided tour! an exhibit and provide live tours of the island. When: Saturday, March 31st at 9am SLT"
Kae March 22, 2012, 10:51 p.m.
Aevalle Galicia/Stasia Weston March 22, 2012, 10:33 p.m. This is more of a "play date" than a tour but I hope you'll enjoy the sims. We'll head first over to the Iron Cloud high above Caledon Middlesea. Plenty here to explore but the big draw of the Iron Cloud are it's runways--you guessed it--we're going to fly! Aircraft will be provided. Just beware of the air kraken! When we get bored of playing in the skies, we'll hit the water, moving on to Caledon Sound. Again, plenty to explore on the island, but submersibles and dive suits will be provided for those who want to see the underwater wildlife that flourishes beneath the waves. Aevalle Galicia/Stasia Weston March 22, 2012, 3:47 p.m. Put on your togas! We'll be back in SL to visit Ancient History sites--ROMA's multiple sims and the Acropolis. We'll meet up at the Bay Boat Welcome Center at Jaguarland (http://slurl.com/secondlife/Jaguarland%20USA%20Education/63/20/27) at 4pm slt and head out from there. Jerry Buchko March 22, 2012, 8:38 p.m. In Reply To: Aevalle Galicia/Stasia Weston March 22, 2012, 3:47 p.m.
Are we planning to do EveOnline as well? Or is that one meant for self study? Aevalle Galicia/Stasia Weston March 22, 2012, 10:16 p.m. In Reply To: Jerry Buchko March 22, 2012, 8:38 p.m.
Eve's going to be later in the month but thanks for reminding me! Kaseido was looking to put together a list of folks interested in going in to witness a raid. Emis.G March 23, 2012, 9:30 a.m. Thanks for organising the tour. Sorry I wasn't able to stay for it all - I went back later and had a longer visit to Roma on my own. Jerry Buchko March 24, 2012, 6:59 p.m. In Reply To: Aevalle Galicia/Stasia Weston March 22, 2012, 10:16 p.m. I would love to witness a raid, but would need to clear quite a bit of hard drive space to install Eve (and it's only a 14 day trial(?). Any chance someone would be able to capture a YouTube of the raid? Kae March 24, 2012, 8:18 p.m. In Reply To: Jerry Buchko March 24, 2012, 6:59 p.m.
pipcleaves March 22, 2012, 1:10 a.m. I took my own tour today. I followed the VWBPE notecards through Jokaydia and enjoyed the opportunity to get my 'sea legs' in VW again. I also ducked over to Second Life and follwoed the ROse Theatre, Ballet and Celdon. It was very inspiring. I would imagine a number of learning activities in these zones. Gridjumper March 21, 2012, 10:08 p.m. Sorry i missed the Jokaydia tour. When i got there I realized i was an hour late so i did not see the tour. Would love to have the landmarks. Aevalle Galicia/Stasia Weston March 21, 2012, 11:13 p.m. In Reply To: Gridjumper March 21, 2012, 10:08 p.m. I had some technical issues there at the end and couldn't finish the tour but the cards we used are right there at the Welcome area in Scooter (just look for the green and white spinning cubes). kimmer March 24, 2012, 10:52 a.m. In Reply To: Aevalle Galicia/Stasia Weston March 21, 2012, 11:13 p.m.
Aevalle Galicia/Stasia Weston March 24, 2012, 8:48 p.m. In Reply To: kimmer March 24, 2012, 10:52 a.m.
After the tour tonight, I can certainly put up a "vwmooc" box with the SL tour notecards we used this week at the Aether locations. (And if you want to explore elsewhere, there are tour notecards throughout the building--Caledon and Steamlands on the lower floor, educational stuff on the upper). The tour card we used for JokaydiaGrid is right at the rez point (just look for the green and white box). Aevalle Galicia/Stasia Weston March 24, 2012, 11:31 p.m. In Reply To: Aevalle Galicia/Stasia Weston March 24, 2012, 8:48 p.m.
Just placed the box on the table just inside the door at all the Aether Travel locations (Jaguarland, Caledon and EdTech)--four notecards containing the info for what we did for the tours in SL this week. Just click and it'll give you a folder. Aevalle Galicia/Stasia Weston March 21, 2012, 12:47 a.m.
You'll need to go to www.jokaydiagrid.com and sign up (link's at the top of the screen) and download the Hippo Multigrid viewer. Use the "foot in the door" orientation file below if you need more info/help. Fair warning, there's a bit of ruthing going on, so you may want to arrive early to get "dressed out". We'll be using the JokaydiaGrid Community tour notecards, available near the rez point.